Instant white rice gets a flavor boost from broccoli, Ranch dressing and melty mozzarella. We popped the tasty mixture in muffin cups just for fun. Preheat oven to 350°F. Prepare rice as directed on package, substituting chicken broth for the water. Place cooked rice in large mixing bowl; cool slightly. Stir in remaining ingredients until well blended. Spoon mixture evenly into 8 greased muffin cups. Bake 25 min. or until lightly browned. Save 1.5 grams of total fat and 70 milligrams of sodium per serving, by preparing as directed, using instant brown rice, low sodium chicken broth and KRAFT Lite Ranch Dressing. 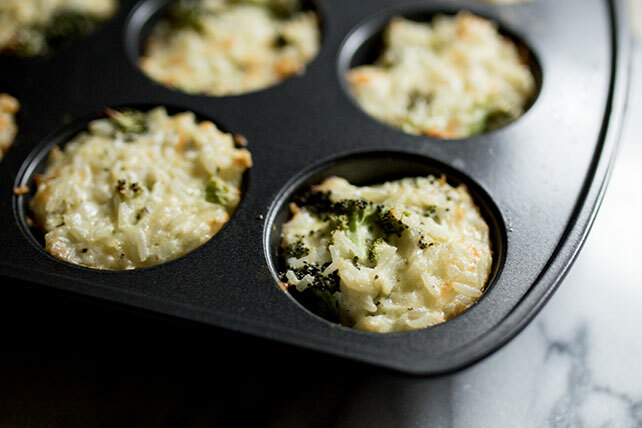 Try our healthy living version of Broccoli and Cheese Rice Cups. Thaw frozen broccoli in the refrigerator overnight or unwrap, place in a microwaveable bowl and thaw in the microwave as directed on the package. Substitute 1/2 cup fresh broccoli florets for frozen chopped broccoli.